Review of the 4 Best OWB Holsters for Glock 19 - Available right now! OWB is an acronym referring to “Outside The Waistband”, this method of conceal carry is regarded to be the most comfortable compared to inside the waistband (IWB) method. Apart from offering unlimited comfort, OWB holsters offer a variety of carrying options which include the 3 o’clock carry, cross draw and appendix carry. Although this method doesn’t conceal your gun entirely, the overall comfort and reliable retention makes it the best option for security personnel at their line of duty.The best way of concealing a Glock 19 compact gun is through using an OWB holster. 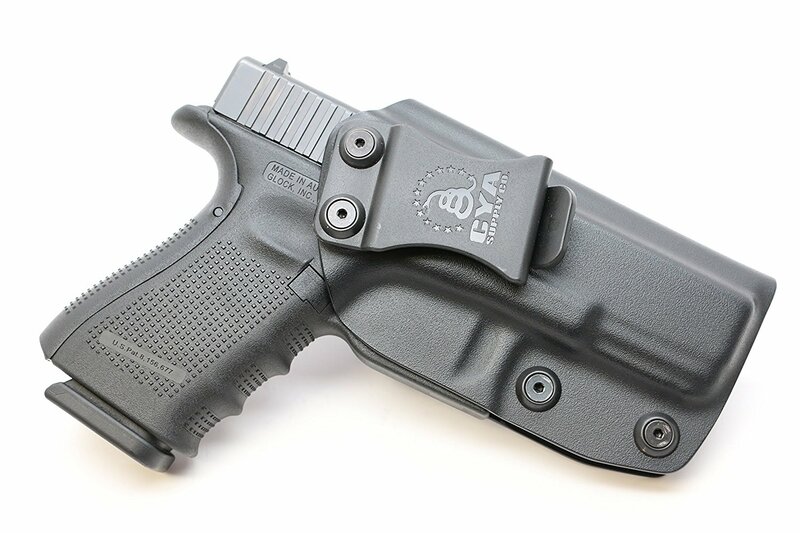 The CYA Supply Co. IWB Holster is one of the best holsters designed for Glock 19 pistols. Designed to be worn inside the waistband, this OWB holster offers a perfect conceal carry solution for those people who wish to hide their guns from the public. To ensure that this OWB holster doesn’t cause any friction or discomforts, the manufacturer has opted to use a tough Boltaron thermoplastic material to provide impact and temperature resistances as well as reduce chances of pistol wear during draw and re-holster. Made entirely in the United States, the CYA Supply Co. IWB Holster is one of the best open carry holsters available in the market. The audible click provides better security for you. The holster is not an international product, but rather made in the USA which provides fast shipping. The immense comfort feature allows easiness when walking, drawing or re-holstering your glock 19 pistol. The next open carry holster we’re going to review in this guide is the Green & Black USA Flag Kydex OWB. Made entirely from kydex, this holster is highly durable and concealable making it one of the best options available in the market. Why use kydex? The reason why Outlaw Holsters used kydex is due to its superior thermoforming properties and the fact that it’s thin yet durable. It is made entirely from durable kydex material. The concealment feature of this holster offers an effective way of concealing your pistol without making you uncomfortable. 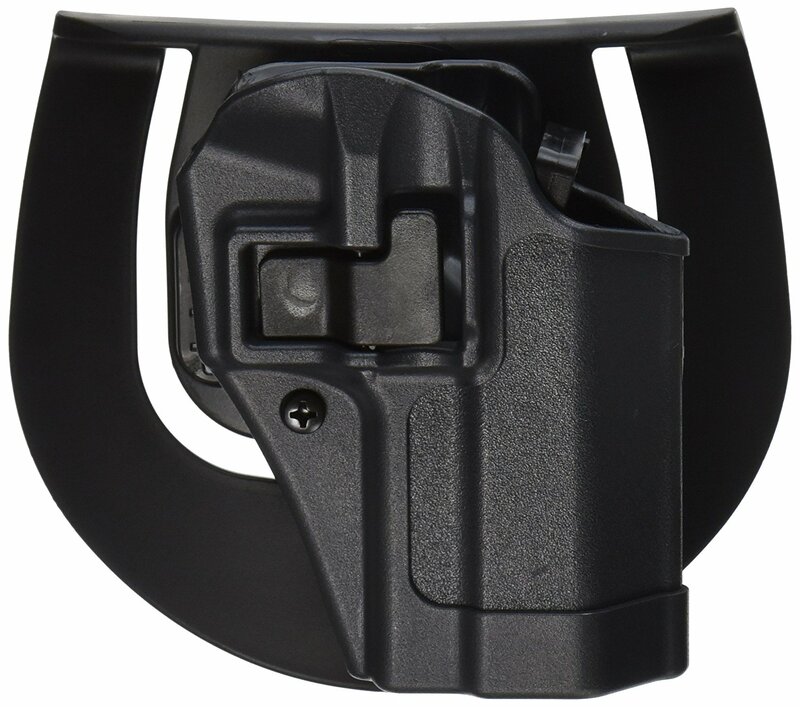 This holster is designed with an open bottom and adjustable tension screws. The item is constructed with a thin 0.080 inch (0.2 cm) thickness that makes it light and usable with a variety of different pistols. It is designed with adjustable tension screws and as well as an open bottom for easy cleaning process. The Green & Black USA Flag Kydex OWB is among the most consistent and durable glock 19 owb kydex holster available in the market. Constructed from traditional polymer material, this holster offers strength and durability making it the best glock 19 tactical holster for professionals. Most people frown whenever they hear the word owb holster but the truth of the matter is that this open carry holster features a special Serpa design that keeps your glock 19 pistol close to your body for effective concealment. Last but not least, the BlackHawk Serpa Sportster Paddle Holster is designed with a special auto-lock feature and an adjustable retention that allows you to adjust the draw angle to suit your needs. Owning our 4t spot, the R&R HOLSTER: OWB Kydex Holster is regarded as a serious piece of kit for security personnel and professional shooters, this owb holster is not only tough but it also works well to secure and conceal your pistol from the public eye. Regarded as one of the best owb holster for glock 19, this holster is easy to adjust to any angle of your choice making it easier for you draw or re-holster your pistol with much simplicity. The R&R Holster is light weight and is designed with thin kydex material that has been tested and proven to be durable and extremely resistant to harsh weather conditions. The audible click feature helps in providing signal to the gun owner that the weapon is safely secured. The open bottom features allows you to fit other type of handguns other than Glock 19. 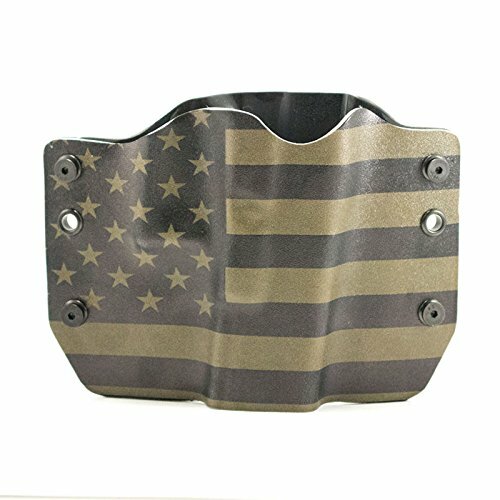 This holster is not an international product, it is made in the USA itself. It is made with Kydex material, which guarantees you that it will last for years. The item comes with one year replacement warranty. It can be adjusted from 0-15 degrees. 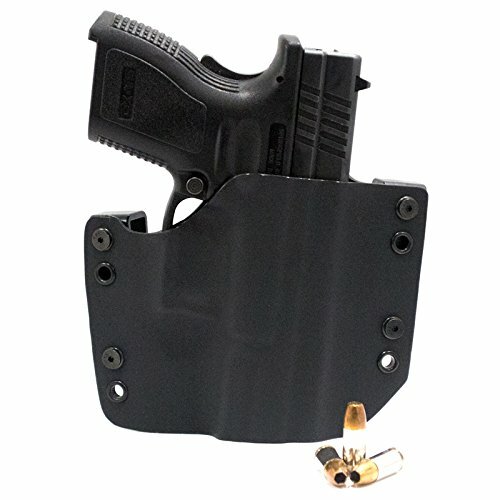 What is the best owb holster for glock 19? After a thorough review of each of the holsters in this guide, it’s fair to argue that each one of them have accomplished their intended purpose quite well. However, following a comprehensive review and comparison of the four holsters, my final verdict is for the CYA Supply Co.
IWB Holster as the overall winner. Designed as an inside the waistband holster, this open carry holster offers you the perfect way of concealing your pistol from the public eyes. To make the holster tough, the manufacturer has opted to use Boltaron thermoplastic material to make it comfortable and resistant to elements of nature. If at any case the CYA Supply Co. IWB Holster doesn’t appeal to you, you can as well consider our runner up which is the Green & Black USA Flag Kydex OWB. Made entirely from kydex, this holster is highly durable and concealable making it the best glock 19 tactical holster in the market today. The reason why the manufacturer prefers kydex over other materials is due to its superior thermoforming properties and the fact that it’s thin yet durable. This holster is designed with adjustable tension screws and an open bottom that makes it usable by a variety of different pistols. With the availability of multiple holsters in the market, most newbies have been wondering about those factors you need to check at before making your purchase. Although there is the obvious reason of safety, there are other considerations you need to keep in mind when choosing the best glock 19 tactical holster. Retention. There’s nothing more important than an OWB holster that allows fast retention. This refers on the level of access you have for a successful draw. The retention feature is important, make sure your OWB holster is going to have it. Budget—how much are you willing to spend on a new owb holster? That’s the first question you need to ask yourself. You see, the quality of holsters is highly defined by the price so when selecting your best option, always consider the price factor. Weight—the best open carry holster for glock 19 should be light enough to compensate the weight of your pistol. You see, if your holster is heavy, your gun tends to sag at the waist area something which may cause much burden when walking. To avoid this, you should choose a light owb holster that’s capable of providing you with maximum balance, comfort and convenience. Comfort—a holster is designed to be worn at all times. To ensure that you stay comfortable for long hours, look out for an owb holster stitched from soft materials that are gentle on your skin. Also, ensure that the holster is well adjustable and capable of concealing your glock 19 pistol in various positions.